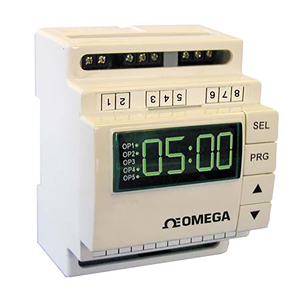 The PTC-15 timer is a programmable digital timer with five relay outputs, each of which has five selectable operating modes and an external start/reset function. Each output can be programmed either in timed or instantaneous mode, making it a particularly flexible unit for in-panel machine control applications that do not warrant the cost or complexity of an industrial PLC. The PTC-15 is an economic alternative to individual DIN rail mounted timers or relays, reducing installation costs by keeping wiring to an absolute minimum. Simple programming, a large bright LED display, and a standard DIN rail mounting package only 70 mm (2.75") wide make the unit particularly attractive in applications where space is at a premium. The PTC-15 covers time ranges from 0.1 seconds to 100 hours in one model and is available in 12/24 Vac/Vdc or 110 Vac and 230 Vac power supply versions. The programming routines are password protected for security.